Snuggled Comfortably between the small, quaint town of Jedburg and fast-growing Summerville, South Carolina, the new neighborhood of Blackberry Creek is all about quality of life. The development, a project of KB Home, one of the nation�s leading home-builders, eventually will include 183 homes. Those who buy at Blackberry Creek will have a choice of 13 floor plans, ranging from 1,336 to 2,224 square feet, with prices starting at $166,990. Since it was established centuries ago, Summerville has been known as a place of relaxation, and Blackberry Creek continues that tradition by offering those who work in nearby cities a place to retreat each night without commuting long distances. Near Interstate 26, its location offers easy access to plenty of shopping and dining, historic Charleston, outdoor recreation and the area�s beautiful beaches. Nearby Summerville is a fun town with many festivals, farmers markets, and other seasonal gatherings. Ned Beck, director of marketing for the South Carolina Division of KB Home, is enthusiastic about the wooded home sites and the walking trails throughout the neighborhood. �Where else can you find so much home for so little price?� he asks, adding that Blackberry Creek is an appealing community for a broad spectrum of buyers. Three model homes�Hurst, Malvern and Oglethorpe�and on-site, and virtual tours of the other 10 are available on the KB Home CarolinaWeb site. Sales counselor Suzy Whitman explains that �Some of the homes have stone, which gives them a cottage feel, but are traditional in style.� The neighborhood is tucked away and much of the trees and natural landscape have been preserved,� she adds. This quaint subdivision offers many amenities, such as walk-in closets, Whirlpool appliances, Delta faucets, architectural shingles, smooth ceilings, marble vanities and other options, depending on which floor plan you choose. 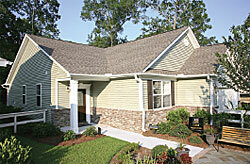 Ponds and common open spaces will help perpetuate Summerville�s reputation for Southern living.